How is the limitation by ASIN working? "I have many product listings, but I want to use River Cleaner only on 5 of them." 1) Navigate to your dashboard and connect to your Amazon account (Step 3). Give it some time and you will see your product listings appear below. 2) Single left-click to select the products that you wish to optimize and to receive email alerts for. You can search for listings by typing the ASIN or product's name in the search box or just use the navigation arrows to locate the desired listing. The border of the selected products will be highlighted in blue. Click Save to confirm the selection. This action cannot be undone, so make sure you have selected the right products. You can always upgrade your account to select more products later. 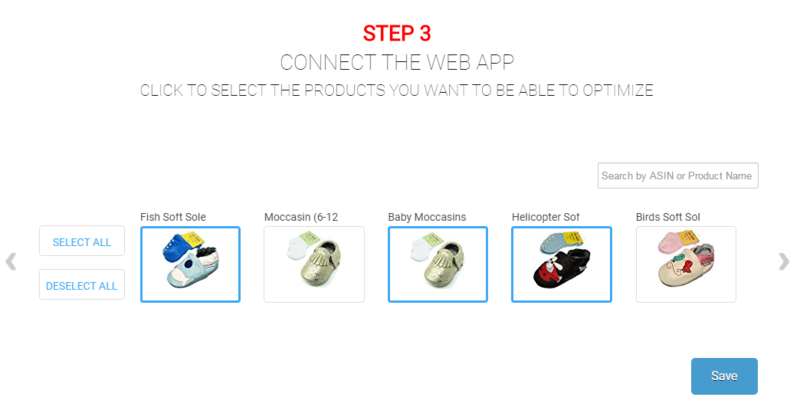 3) Select the alerts you want to receive for the selected products. You can now start using the extension inside Seller Central and all the other features in the web app for the selected products.